Congratulations, Michael Conforto! You’re not only the savior of the franchise, you’re also in line to be the club’s 1,000th overall player when you make your debut tonight at Citifield. To anguished fans beating themselves up over the state of the offense, this promotion will never have come soon enough but if you ask me more changes are likely on the way in the next week or so. Given his remarkable deliberateness in the face of so much (real and manufactured) fan and media outrage, not my admiration for Sandy Alderson is actually growing. Everyone forgets how easy it used to be to either push the Mets into stupid decisions or simply witness the club with its priorities all wrong when they did make a move. This is kind of exciting. Conforto as been well-reported has been issued No. 30, which is actually one of the rarest numbers under 50 in team history. He’ll be just the 19th player to wear 30, thanks largely to Mel Stottlemyre‘s nine-year occupation in the 80s and 90s. It’s a number that most recently belonged to Andrew Brown, and most famously represented by Cliff Floyd, but at the risk of dating myself I tend to associate it with Mike Torrez, a bit of a poor man’s Bartolo Colon in the 1980s. It’s also appeared on the backs of a handful of reserve catchers like Brown (he was an emergency catcher, anyway), Alberto Castillo, Raul Casanova and Josh Thole, who eventually became a disappointing starting catcher. Thirty of course was also retired, by the Angels, in honor of ex-Met and former 30, Nolan Ryan. Thrilled to see today that the Mets went and signed veteran stickman Michael Cuddyer, who, given the usual caveats about age and injury and old outfielders signed by the Mets, is almost exactly what the club needed: That is, a good righthanded hitter who can play a corner outfield slot and first base, with the bonus of being a FOD (Friend of David). He’s the new Moises Alou! 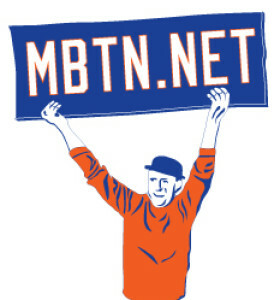 Seriously, the news that Colorado had extended a Qualifying Offer cooled expectations to a point where I was working hard to convince myself that Allen Craig or Michael Morse — poor men’s Michael Cuddyers, at best — were worth a shot, or maybe saying the hell with it and overpromoting Brandon Nimmo was going to be the plan. But I’m glad this worked out, and with a price that’s none too steep given the potential to make a difference. Cuddyer you should know wore No. 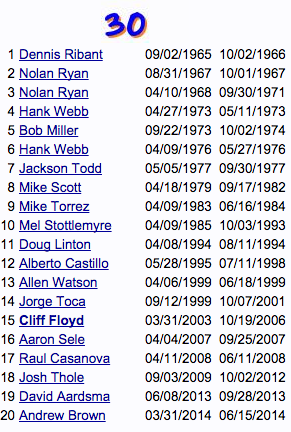 3 these last few years in Colorado but that’s because Carlos Gonzalez occupied the No. 5 Cuddy rocked all those years in Minnesota. He not about to take either digit in NYC, but we could make a case for 55, or maybe, No. 1 if fans can forget about the doomed Chris Yound experiment. The Mets in the weeks leading up to this signing prumed the 40-man roster and lost a few misnumbered guys along the way. Little doubt I liked Andrew Brown more than Terry Collins ever did, but he’s been claimed by the Athletics. Catcher Juan Centeno in the meantime is taking his weird No. 36 to Milwaukee. The Mets on Wednesday announced Jose Valverde as the second candidate to become this year’s Special Guest Veteran Closer, a role played a year ago by Brandon Lyon and LaTroy Hawkins and the year before by Jason Isringhausen. Valverde at one time was a heck of a closer for Detroit, but became something of a gasbag by 2012. One of his competitors in Mets camp is the mookish Kyle Farnsworth, himself a former 100-mph freak but more recently the kind of guy teams reach for when they’re unsure of the health of their closer. I guess the Mets sort of qualify. Farnsworth has been issued No. 44, which is the number I recall him wearing back when he was a phenom with the Cubs. No word yet on Valverde’s digits though he’s most often worn 47. That number currently belongs to Andrew Brown, whose own path to a job this year appears difficult, especially if Josh Satin really learns how to play the outfield. Purely as a matter of taste I’d prefer the demonstrative Valverde over the combustible Farnsworth but history suggests we stand a pretty good chance of seeing both, or neither. Let’s see how it goes.